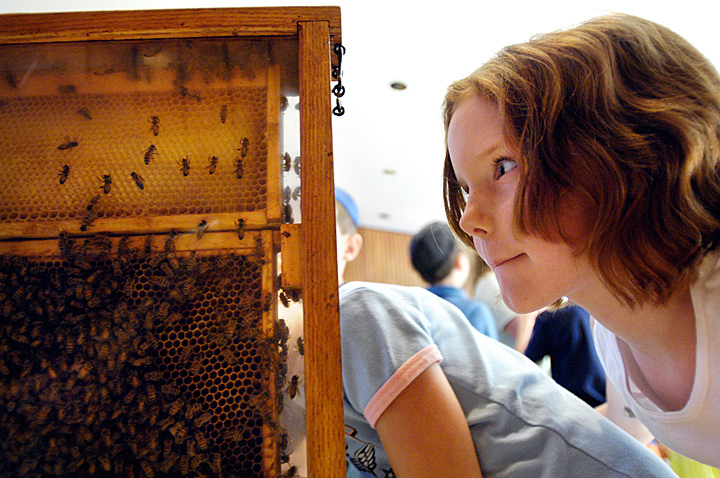 Ella Metzger, 7, peers through a hole in the side of a beehive display as children from the Agudas Achim Jewish Synagogue in Peoria learn about bees and making honey as part of Rosh Hashanah Sunday afternoon. The Jewish tradition of eating honey on the high holiday celebrating the Jewish new year is to physically show God that they want a sweet year. Following a presentation by beekeepers Danny and Janet Hart of Brimfield, the children made their own Rosh Hashanah honey jars.